For Chris Mannella it was just another day of training. He showed up to the Toronto FC Kia training grounds ready to work hard, and hoped to be noticed by the first-team training staff. So, it was a bit if a surprise when TFC GM Tim Bezbatchenko pulled him aside and gave him the news he'd been waiting a lifetime to hear – he was offered a professional contract. "They were ecstatic when I finally told them, as you can imagine." 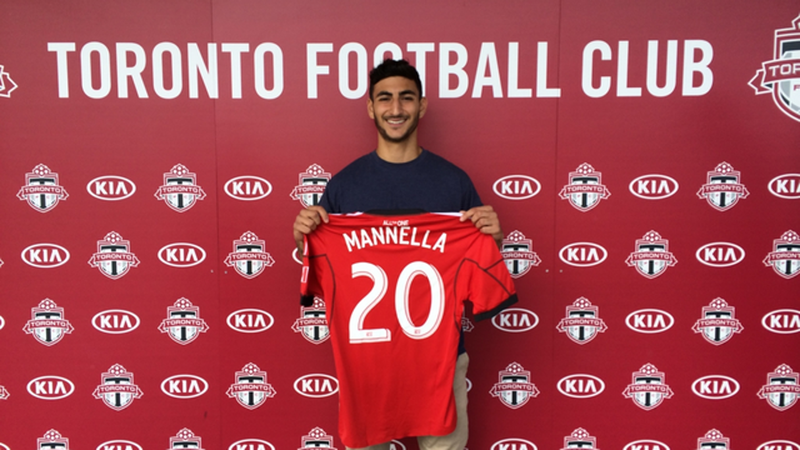 Mannella had trained throughout the year with the senior team, but it is still a bit surreal to be an MLS player. "The guys have been great," he stressed. "They've gone out of their way to tell me what to expect, and help me adjust." Still, Mannella understands that as a professional the onus will now be on him to prove that he belongs. "(Signing) really doesn't change much (day to day). I still have to go out every day and work hard to prove myself. Just because I signed a pro contract doesn't mean my work is done." Mannella credits the TFCA system for making the transition easier. He says that head coach Mike Stefano goes out of his way to stress the importance of playing like a professional even before you actually are one. It was that philosophy that has allowed TFCA to be so successful in League1 this year, Mannella says. "The league has been great (for us)," he said. “The competition has been great and it's pushed us to be better." Mannella says that there is only one downfall to signing a pro contract. "The senior academy team is a special bunch of guys. They've worked hard to accomplish what they have."